Persistent weather patterns that produce prolonged periods of freezing rain or drizzle can coat vegetation and all exposed objects with clear glaze to thicknesses well in excess of 5 cm. The considerable weight of this icing, especially if accompanied by high winds, creates a major strain on electrical power lines, towers and conductors, which may fail as a result, leading to power outages. Sleet accounts on average for more than 5 percent of all outages and almost 12 percent of all customer-minutes of interruptions annually. In a relatively small number of years the power system has been paralysed in certain sections of the province as a result of a major, prolonged sleet storm. 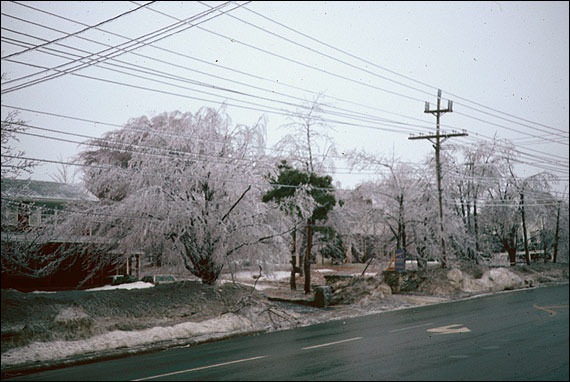 Examples include (1) April 11-14, 1984, over the northeast Avalon peninsula, including Bell Island: loss of power for up to 4 days; $10 million cost to the system and its customers; ice up to 22 cm thick on a one-inch diameter conductor wire; (2) a 43-hour storm in late March, 1958, which also caused disruption and hardship on the northeast Avalon and Bell Island. Poor summer weather, characterised by frequent rain, limited sunshine and temperatures well below normal, is likely to have negative impacts on agriculture (delayed maturing of crops, with poor yield and quality), forest silviculture (reduced growth rates for young planted trees), outdoor recreation (cancelled sports fixtures) and the tourist business (reduced "impulse" vacationing and short-term trips during persistent poor weather). The summer of 1980 was particularly wet and cool in Newfoundland, with unfavourable consequences for agriculture. Records show an overall low yield	for root vegetables and hay. From Guthrie, K. and M. Fleming, "The Wet Cool Summer of 1980 and Its Effects on Newfoundland Agriculture" in D.W. Phillips and G.A. McKay, eds., Canadian Climate in Review, (Environment Canada [A. E. S.], 1980). Reproduced with the permission of the Minister of Public Works and Government Services, Canada, 1999. Modified by Duleepa Wijayawardhana, 1999. Thin or uncertain snow cover conditions are clearly unfavorable for traditional winter sports activities and the businesses associated with them. Recent relatively mild winters in 1996, 1998 and 1999 have resulted in snow depth significantly below long term normals over much of the island, with more frequent rain and thaws. Skiing and snowmobiling conditions frequently ranged from less than ideal to non-existent, particularly at lower elevations. An abnormally mild winter also disrupts winter logging operations. Heavily laden transport trucks are unable to negotiate woods roads made soft and muddy through lack of hard frost; if the problem persists, the supply of timber to pulp mills can be slowed or halted, leading to plant downtime. Although Newfoundland is generally spared the most severe categories of intense, short period rainfall associated with summer season thunderstorms, significant rainfall accumulations can occur over periods ranging from a few hours to a few successive days, under certain weather patterns. The probability of any one location experiencing a heavy rainfall above specific amounts in a given number of years (known as the "return period rainfall") is reasonably well known for only a few places. Adverse effects include saturation of ground to the point that subsequent surface runoff, combined with the heavy rain, leads to swollen rivers and streams, some of which overflow their banks and produce localised flooding. The Romaine's River, near Stephenville, at its normal water level. Reproduced by permission of Dave Taylor. ©1995. The Romaine's River, near Stephenville after a heavy early summer rainfall. Typically, direct damages occur near the base of hillslopes and close to burst riverbanks, and include flooded basements in homes, washed out roads, culverts, bridges and road shoulders, and severed water lines. Recent cases include (1) Flat Bay River, south of Stephenville: at least twice in the past decade, from heavy frontal system rainfalls; (2) Goulds-Mount Pearl-Manuels (northeast Avalon): 70-80mm rainfall in a few hours from tropical storm Hortense, 15 September 1996 (3) Burin peninsula and Bonavista Bay areas: 100-130mm in 24 hours from tropical storm Luis, 10-11 September, 1995. The joint occurrence of a very heavy rainfall event and temperatures well above freezing, together with substantial and rapid snowmelt, presents a potentially dangerous flooding situation. This is especially true for larger river catchments with extensive upland headwater areas that favour significant prior snow retention and orographic magnification of the intensity of the rainstorm. 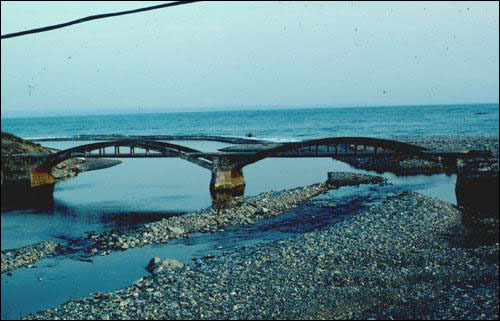 An exceptional case of this phenomenon took place in January, 1983 over south-central sections of the island, which resulted in the worst case of flood damage in the province that has been documented. Between January 12-14 rainfall exceeding 200mm fell over a broad upland area extending north from Head of Bay d'Espoir to the headwaters of the Northwest Gander River and including southern tributaries of the Exploits River. Note the large area of rainfall greater than 200 mm, centred near Head of Bay d'Espoir. 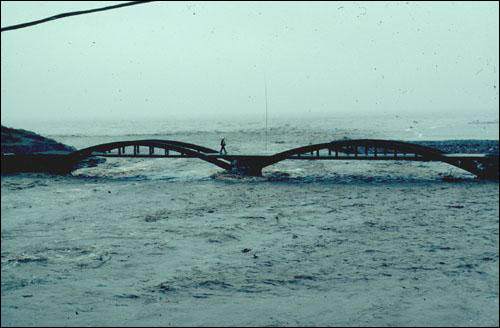 The Flood of January 1983 in Central Newfoundland. Prepared jointly by Environment Canada (Inland Waters Directorate - Atlantic Region and Atmospheric Environment Service - Atlantic Region) and Government of Newfoundland and Labrador (Department of Environment, Water	Resources Division), 1985. Reproduced by permission of Environment Canada and the Newfoundland Department of Environment and Labour, 1999. Modified by Duleepa Wijayawardhana, 1999. Much of the rain occurred in association with the warm sector of a deepening low pressure system to the south, which also fed very mild air into the region on the 13-14th (maximum temperatures exceeding 10°C). As a result, the impact of the exceptional rainfall was supplemented by rapid melt of thesnowcover, which exceeded 40cm depth over northern sections of the affected area. The impacts were greatest downstream within the Exploits River valley, particularly at Bishop's Falls, where unprecedented flood damages, amounting to over $33 million within the Exploits basin, affected many buildings, Abitibi-Price hydro facilities, recreational sites, roads, water supply and sewer systems. For a description and source see below. 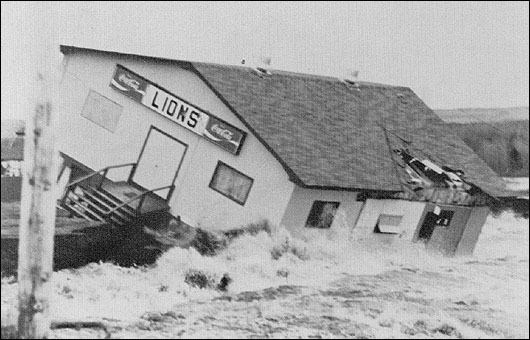 A picture of the Lion's Club at Bishop's Falls as it was being destroyed by the raging waters of the Exploits River on January 14, 1983. For an animated gif showing the destruction of the Lion's Club, visit the Flooding in Newfoundland page on the provincial government website. 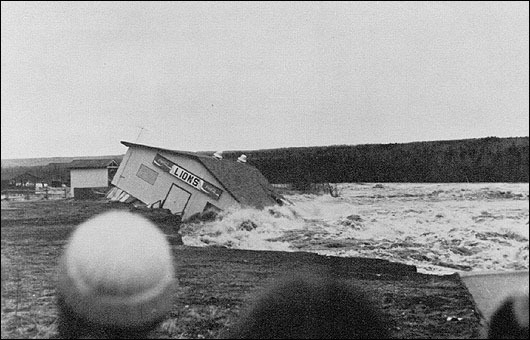 The Flood of January 1983 in Central Newfoundland. Prepared jointly by Environment Canada (Inland Waters Directorate - Atlantic Region and Atmospheric Environment Service - Atlantic Region) and Government of Newfoundland and Labrador (Department of Environment, Water Resources Division), 1985. Reproduced by permission of Environment Canada and the Newfoundland Department of Environment and Labour, 1999. There is increasing recognition of the potential hazards of rock falls, mudslides and snow avalanches on the island and in Labrador. Amongst the factors that trigger these falls and slides, weather conditions are often critical. 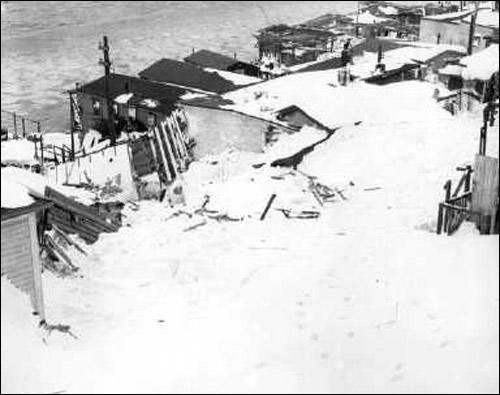 This avalanche happened during the early hours of February 16, 1959 and followed a record 24-hour snowfall of 81 cm the previous day. Both images reproduced by permission of Shirley Eales ©1959. In the case of snow avalanches, some of the most well documented cases in the province are known to have been immediately preceded by very heavy snowfalls and strong winds, causing dangerous snow build-up on steep slopes and fatal consequences. 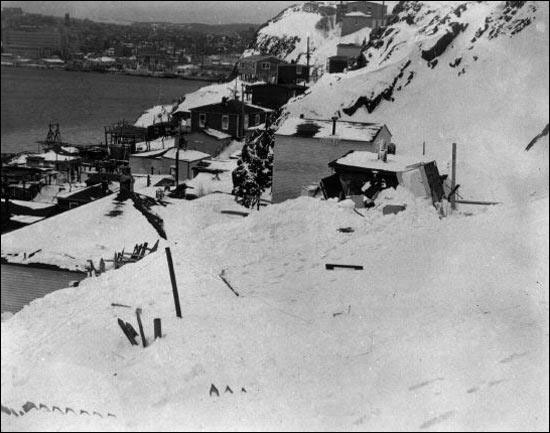 Examples include (1) the Battery, St. John's in the early hours of February 16, 1959, which followed a record 24-hour snowfall of 81cm the previous day; (2) Blanc Sablon in the early hours of March 10th, 1995, closely following a lengthy blizzard along the Labrador Straits shore, which further added to an already substantial late-winter snow cover.